Errol Flynn and Kevin Costner both played Robin Hood (though not at the same time), and Al Jolson sang about the “Red, red Robin” doing its “bob, bob bobbin’along.” Now it’s time to meet another Robbins (Trina Robbins, that is) whose work deserves (if not a song or a movie remake), then the respectful appreciation of art and social culture patrons both. Using that ancient tool called a telephone directory, I contacted Trina Robbins, who now lives in San Francisco, and answered her own phone (! ), responding beautifully to my questions. Let me share her thoughts with you. “I no longer draw. I am a full time writer of books and comics and a ‘herstorian’ and have been so for over 20 years now. Also, when I did draw, I did not draw ‘cartoons’ – I drew comics. Golden Age women cartoonists who drew comics during the war, and their heroines were beautiful courageous women who fought the Axis and who didn’t need to get rescued by some guy. “The other collection is a two-volume boxed set of the complete Wimmen’s Comix and ‘It Ain’t Me, Babe.’ Babe, 1970, was the very first ever all-woman comic book. Wimmens, 1972-1992, was the first and longest-running all-woman comics anthology. So it will be very satisfying to finally see them when they come out. As with most folks, Trina has had her share of ‘the lows.’ “In about 1985 when DC comics gave me the job of drawing a four-part Wonder Woman mini-series, I didn’t yet have enough faith in myself to write it, so it was written by someone else although co-plotted by me. Today I would write it myself.” And in the ‘90’s, “there was a definite low point for me. Many of the venues for which I’d been working disappeared, and I felt like I was a has-been and that nobody wanted me anymore. That was when I simply lost the ability to draw.” Clearly on her way back now as both writer and editor, she is proof of the gift of resiliency and patience. In our Q’ing and A’ing, her reply to our inquiry about where she finds inspiration was brief but telling: “For writing, I read all the time, always have. Books will never run dry.” (And we suspect, neither will Trina. 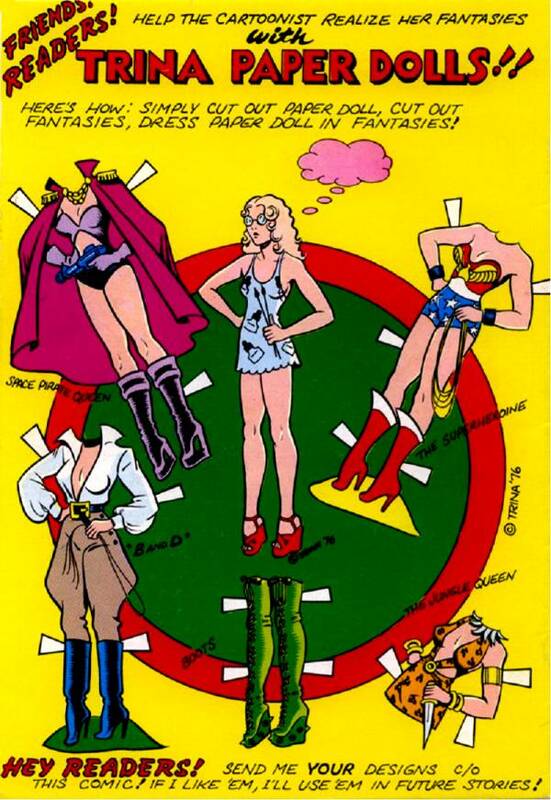 The winged Robin might have had the red breast, but Trina Robbins is clearly among the best read. Enjoy!